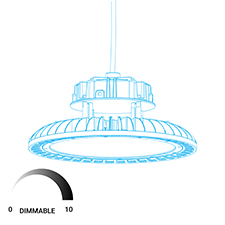 DLC certified UFO LED High Bay light 100W is the commercial grade indoor product for indoor warehouse or any commercial space with a ceiling height of 15ft. - 20ft or more. and with a Correlated Color Temperature (CCT) of 4000K and lumen output up to 11852 Lumens, this high bay light can get you more brightness than old 400W MH lights while it would also save you 75% of energy on each fixture. 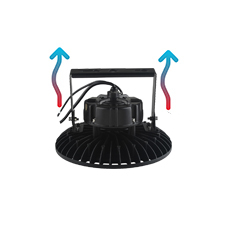 The variable maintenance cost gets down to zero owing to its efficiency and performance.With its inbuilt lighting control feature the fixture can be dimmed from 0V to 10V, can be easily hook mounted on any surface. 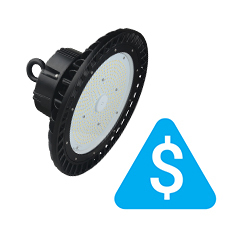 A replacement to 400W MH fixture, the LED 150W High Bay fixture helps save up to 75% on your energy bill. 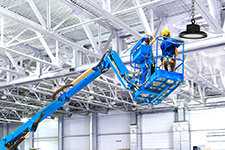 A commercial unit requires a lot of these fixtures, so just calculate your savings here with a single investment. 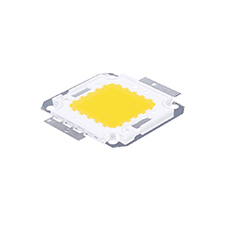 Available Color Temperature is 5700K which makes it an ideal color for indoor commercial space. 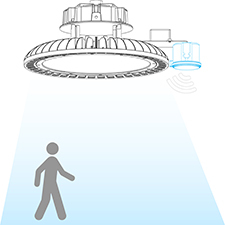 With a lumen output of 11852 Lumens and Lumen Efficacy of 130 Lumens/Watt, LEDMyplace’ UFO High Bay will bring in more brightness than any traditional MH light. 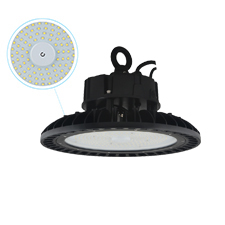 This fixture can easily be hook-mounted or ceiling mounted on the ceiling of the warehouse, with zero variable cost of what traditional fixtures consume. 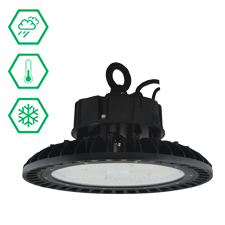 This product being DLC Premium approved/certified can get you rebates & incentives upon installation of the product. The electric current when applied to the leads, the electron gets released and recombine with the electron holes inside the LED device to release energy in the form of photons. 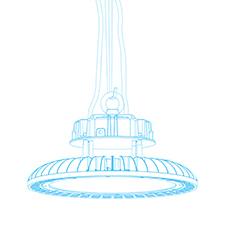 The color of the light hence is determind by the photonic energy. So, it’s a small electron but great power. 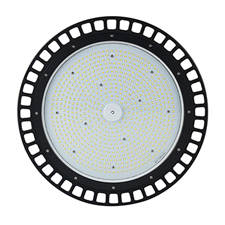 The lifespan being 50,000 hours and with very less lumen depreciation till the end of its lifespan, very low maintenance is needed and hence the costs are also low. 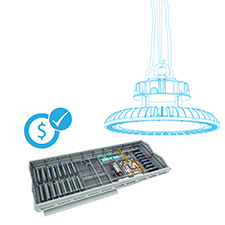 Not every product can have DLC premium certification/approval, the DLC Premium being a high performance classification for luminaires. 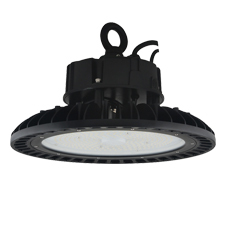 For this, the luminaire must meet certain criteria such as higher lumen efficacy and lumen maintenance requirement. 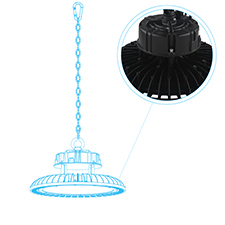 The UFO LED high bay light qualifies to be DLC Premium product so as to come under the scope of energy-efficiency rebate programs and incentives. So, when you have this product installed, you become eligible for those rebates and incentives. So far so good. It’s been installed for about 3 weeks now. I have one hanging about 20’ high in a 20’ x 40’ over hang area of my shop and it’s plenty of light! My customers are always happy with the products I purchase from this company. In the 2 years I have been doing business with this company, I have had 1 warranty claim which was taken care of immediately.